The most advanced Windows blog editor and manager. Get convenience and speed of a native application, and the ability to write posts offline. What makes using BlogJet a lot more comfortable than posting with browser or other blog clients? Format your posts just like in ordinary word processors like Microsoft Word. No need to learn HTML. Insert pictures from your computer or camera, resize them or create thumbnails -- BlogJet will take care of uploading them to your blog or FTP server. Your photos on Flickr and videos on YouTube will complement your blog - and now it's easy to insert them to your posts, as BlogJet supports these services natively. Your mistakes won't go unnoticed thanks to the new spell checker, which supports many languages. If you are tired of writing the same thing over and over again, create an Auto Replace rule for it. For example, when you type Scoble, BlogJet can replace it with a link to Robert's blog. BlogJet now has full Unicode support, so you can write blog posts in any language (including Korean, Japanese, Chinese), and even mix languages. Ribbon Interface and Skins New! New Ribbon style interface with 40 skins such as Office Silver, Office Black, Office Blue, Visual Studio, Dark and more. With awesome tabbed editor, you can write many posts in one window. You can upload images from your posts directly to your Flickr account. BlogJet caches your posts, so you can access them in a blink of an eye (even with no connection). Finding posts is now easier because of the instant search, which shows results as you type. BlogJet now has a live word counter. And with Statistics feature you can find out a lot of interesting information about your blog: how many posts it has, average post length, and number of posts published by days of week. If you are on the road and there is no Internet connection, or if you want to finish your post later, save it as draft. Then you can get back to finishing and publishing it. RSD. This R-word means that you will be able to work with your blog in less than a minute after installing BlogJet, because it will literally configure itself: you only have to enter your blog's address. 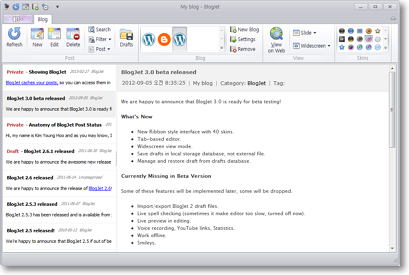 BlogJet integrates with FeedDemon, RSS Bandit, NewsGator and others for you to be able to blog about something in just a few clicks. Sharing documents and files with your readers is easy -- just attach them to your posts. Supports all post statuses in WordPress: published, draft, pending, private, in trash. You can filter posts by the status and can setup default status for every new post in BlogJet. WordPress, TypePad, Movable Type, Blogger, MSN Live Spaces, Blogware, BlogHarbor, Squarespace, Drupal, Community Server, and other blog engines supporting MetaWeblog API, Blogger API, or Movable Type API. BlogJet now allows you to create and edit pages on WordPress, Movable Type, and TypePad blogs. It's not cool to use text smileys anymore :-) That's why BlogJet can automatically replace them with funny graphics. BlogJet cares about typography: it automatically replaces quotes and dashes with proper ones as you type. If you have several blogs, BlogJet can publish the same post into each one of them, even if they are on different blog services. We care about the interface and usability. The easy-to-use graphical user interface in BlogJet looks native on Vista and Windows 7 and works beautifully. When editing your posts, you can select categories and add tags. The new version also allows you to create categories right from BlogJet on supported platforms. Now supports custom fields feature in WordPress. BlogJet now saves drafts in local storage database automatically. Many A-List bloggers use BlogJet every day to write posts, which are read by millions of people throughout the world. Join them – purchase your copy today! New to blogging? Learn how to create a blog. Looking for a diary software for Mac? Get your personal registration key instantly to make the copy of BlogJet that you are now downloading into the full version. It’s risk-free: we offer 30-day money-back guarantee. If for some reason you are not satisfied with the program, you can return it for a full refund.